Grant McCann believes Doncaster Rovers’ performance against Sunderland showed they belong among the League One elite. But now he has urged his players to prove that as they head into a tough run of fixtures. 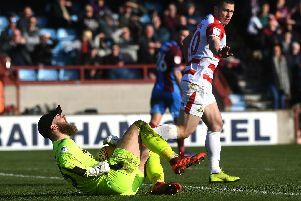 Rovers visit Coventry City and Charlton Athletic in their next two fixtures with tricky cup ties at non-league Chorley and Notts County to follow after. And McCann believes the manner in which his side emerges from that run of games will show whether they are capable of matching the best sides in the division consistently. “I think anyone who saw the game on Tuesday night will tell you that we aren’t far away from Sunderland,” he told the Free Press. “In fact, in my honest opinion, we’re just as good as them. “That’s the way I see the game. “The boys have just got to keep the belief and the desire that we can be as good as these teams, if not better. “We’ll do that and move on. “It’s okay saying, we’ve got to go and prove it. “It’s a long season and we’ve got a long way to go. “We’ve started okay but nothing is won or lost in October or November.